The X-Series BTECH Mobiles introduce our new fully customizable Multi-Color LCD display screen. You can adjust the complete display to be exactly as you want it (with 9 available colors across 10 display elements). Beyond the display, you can fully customize your channels to display their alpha-numeric names or frequency settings. Scanning channels and frequencies has now gotten even easier! A new menu allows you to select scanning resume methods. You can set the radio to start scanning immediately during reboot, resume scanning if you interrupt scanning to transmit, or start scanning soon as it powers on. The UV-25X2 will save your scanning preferences even with a power interruption. Frequency scanning has gotten a full overhaul; you can edit and scan through frequencies exactly as you prefer. Set your frequency range and frequency interval (step) right through the UV-25X2 on-screen interface. 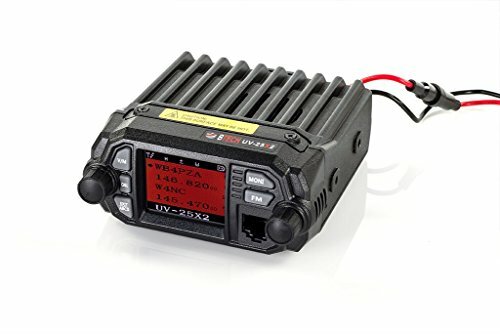 Quad Watch Receiver: The UV-25X2 operates as multiple radios in one, with either 144 MHz or 430 MHz as the "Main" TX/RX band, while simultaneously watching up to 3 other frequencies or channels; and, if you like, you can configure your UV-25X2 for simultaneous VHF-VHF or UHF-UHF operation, too!